Teaching Addition to our youngest young man has presented all sorts of challenges that has left me with small bald patches all over my head is giving me wonderful opportunities to learn new things. One of the things I am learning about is Auditory Processing issues. The more I learn, the more the pieces are starting to fall into place. Dianne Craft’s page has been a Godsend – thank you, thank you, Julianne! 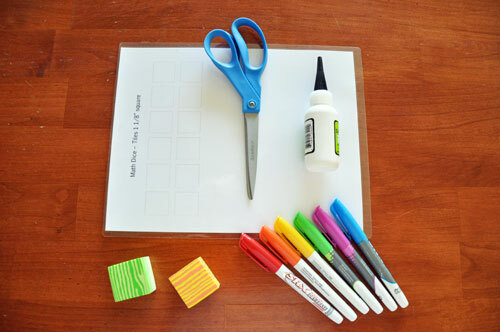 Step 1: Following the template, cut out tiles from your laminated card stock. The blocks I am using are just a smidge larger than 1 1/4″ on each side, so the tiles are 1 1/8″ square. I left a margin of foam around the tiles so that they stay nice and quiet. 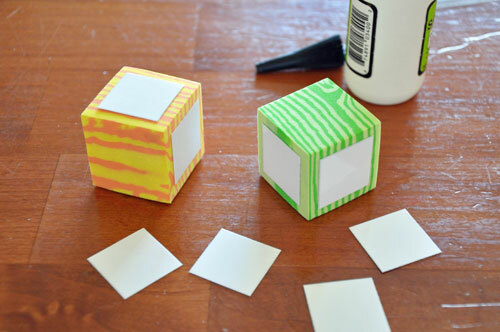 Step 2: Glue the tiles onto the cubes. I’ll bet you were surprised by this step. 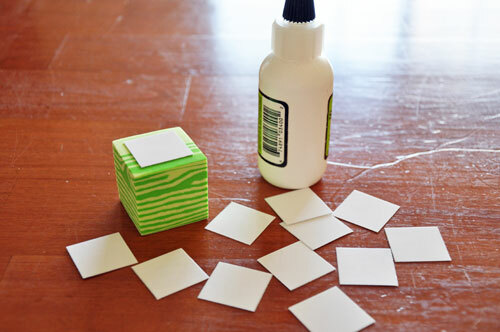 😉 I did alternate which cube I was gluing, to make sure that each tile had enough time to dry in between. 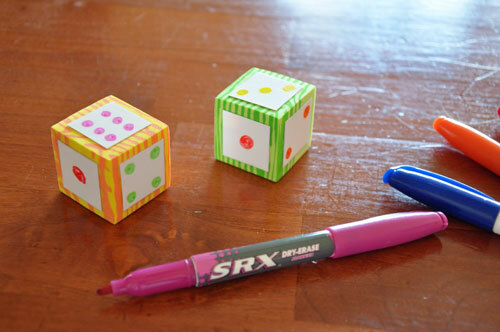 Step 3: Draw the dots onto your new Foamy Math Dice. As far as teaching Addition, why am I excited about this tool? It allows me to control the numbers that Pip is learning to add. I can have a die made up of blank sides or a single dot for Zero or 1, and then add dots from there as he learns. Yes, I definitely love the Foamy Math Dice. I hope you do, too! This entry was posted on Monday, April 26th, 2010 at 12:13 pm and is filed under Auditory Processing, homeschooling. You can follow any responses to this entry through the RSS 2.0 feed. You can leave a response, or trackback from your own site.